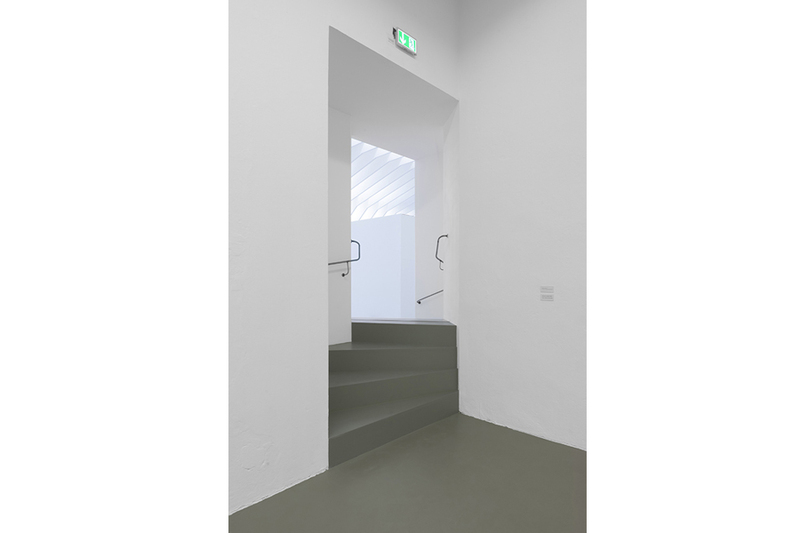 „In the passageway between two exhibition rooms of the Städtische Galerie Bremen, Effrosyni Kontogeorgou installed a staircase with three steps leading up out of the one room, immediately followed by three steps leading down into the next room. 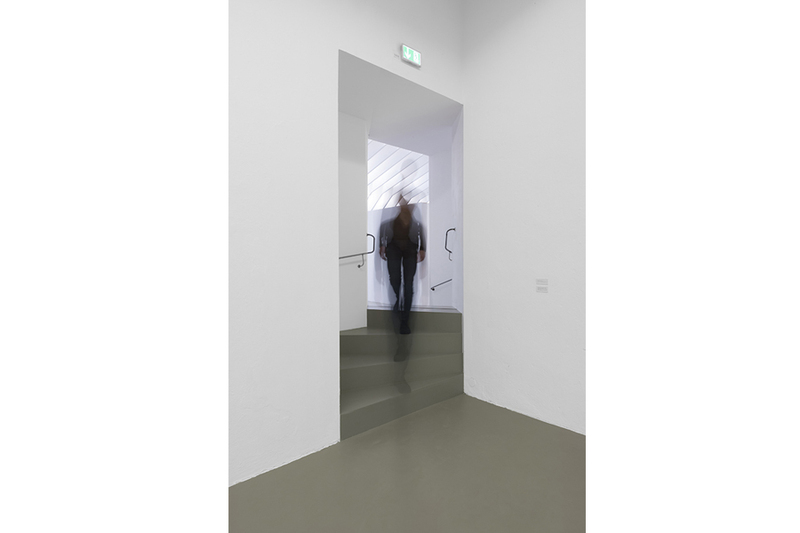 Although these two elements form a unified spatial object and (foreign) object, each is clearly marked by a slightly different grey tone that conforms to the colour of the floor in the room adjacent to it. 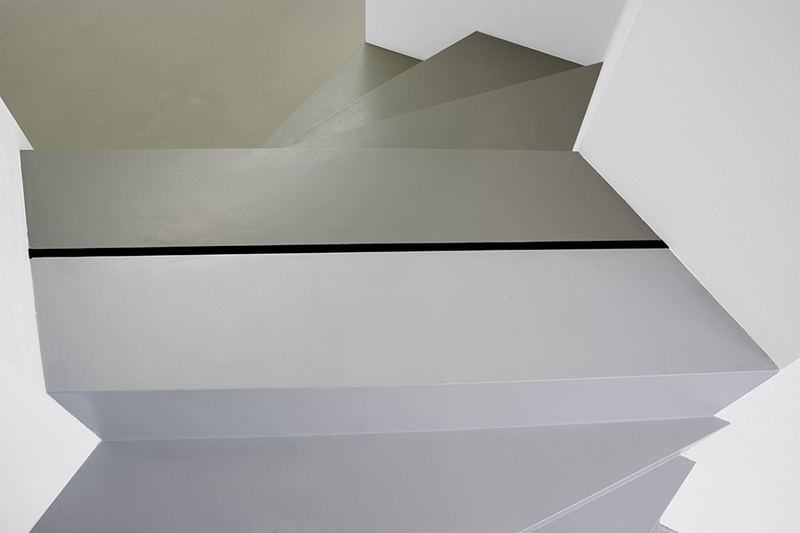 The elements are also marked as separate by a narrow slit in the top step. 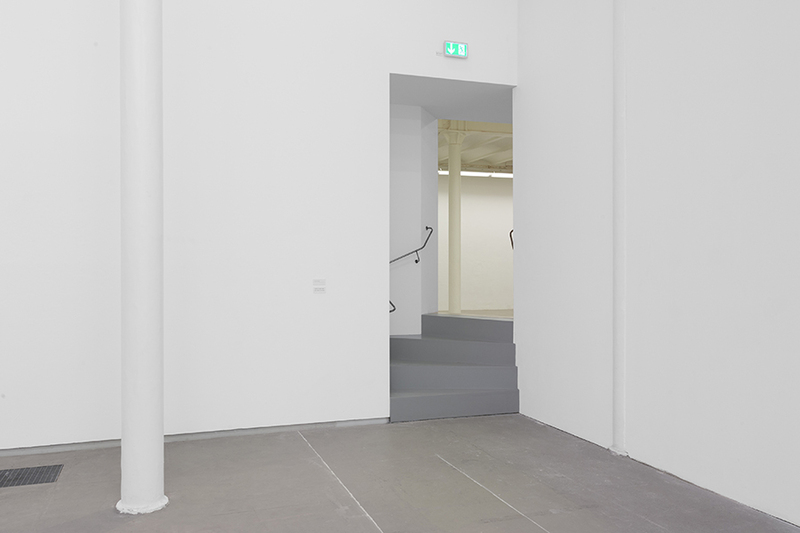 The slit is painted black on the inside and thus indicates a border, a line, a space in between.The passageway, in which the staircase has been temporarily installed during the exhibition of the 40th Bremer Förderpreis für Bildende Kunst, only came to connect the two rooms in recent years, making a circular tour of the Städtische Galerie possible. It fits in with the building’s many curious architectural details that have grown, changed, and been altered over the years: because of irregular walls, it had to be installed with two diagonal bends. This causes the staircase to have a dizzying change of direction. The steps first taper off into this and then that direction. If I use the steps, I twist myself into and out of them again – a surreal movement. Using the installation feels appropriately playful, even if it is experienced as an obstacle because its architectural function seems meaningless for a moment. Visually the matched colours provide an apparently smooth transition, but the bodily experience of it is unsettling. The narrow, black slit in the middle gives one the impression of indeed crossing a threshold – a border between two different sections of a unit, between two mirrored parts. 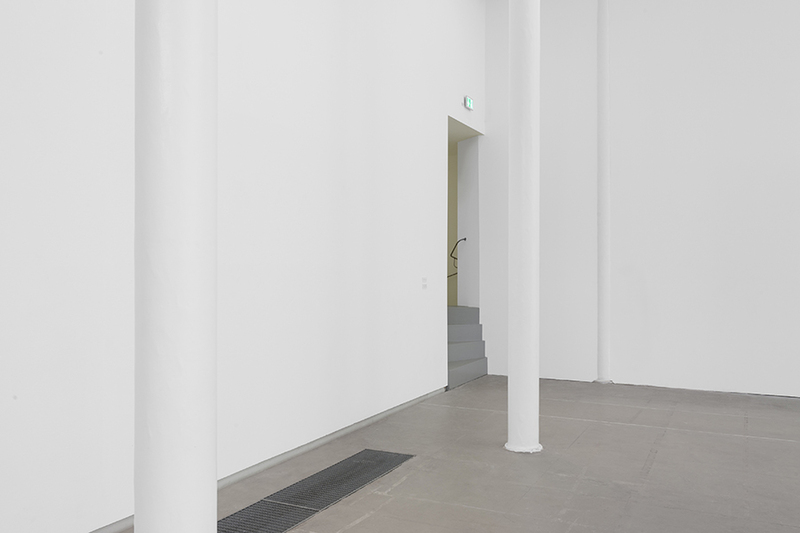 Effrosyni Kontogeorgou references the concept of ‘liminality’, a term used by the ethnographer and cultural anthropologist Victor Turner, who characterised it as a transitional state within a process of social detachment. This state is observable, for example, in initiation rites, with which human societies mark apparent transitions. 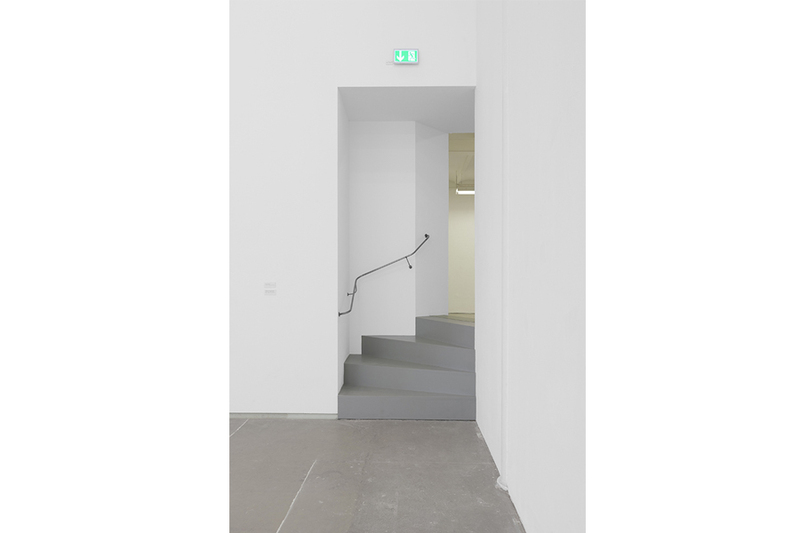 Effrosyni Kontogeorgou took the crossing of the built-in staircase literally and titled the work Threshold. Accordingly, she recognises liminality also as spatial characteristic, creating and marking liminal spaces.